Mike Spicer Cartoonist / Caricaturist. : The Packers' Prayer. So very clever, I can really appreciate this, and I'm English! Mike, this is great! I'm a lifelong Packer fan and just really having a great time the last few weeks. Really enjoying all the Super Bowl hype. 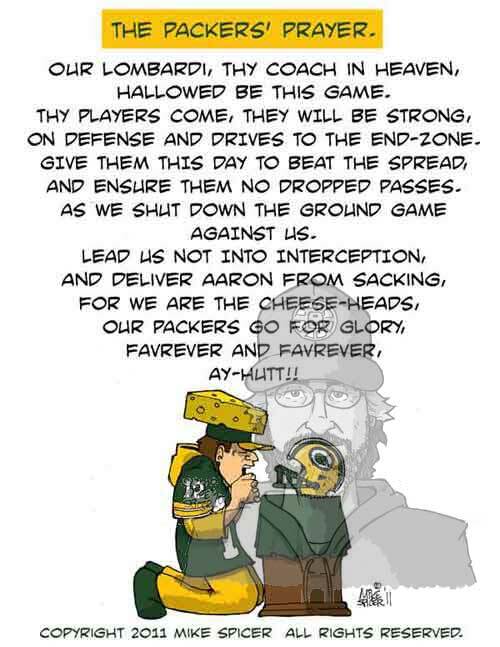 Check out my blog....I've got my Packer artwork featured this week - in honor of the Pack's appearance in the big game. Love this!! You can bet I'll be sharing it and favoriting it! Go Pack, go!!! Yes we want a victory. Welcome to the Facebook Cafe. Celebrity Clerk: The Geico Guy. Celebrity Clerk: Facebook Upgrade Dept. Tech.